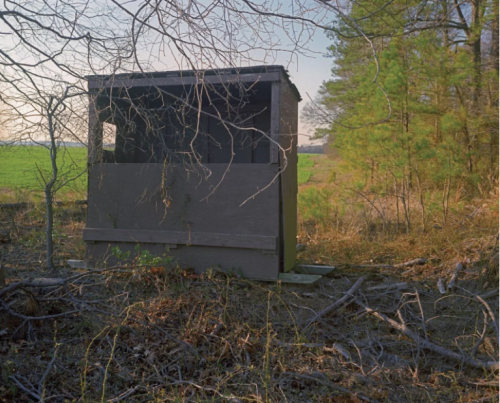 In his formative years, photographer Colby Caldwell found comfort in hunting trips with his grandfather. Though not particularly thrilled about killing anything — often missing his target on purpose — Caldwell clung to the ritual. He returns to these memories in two concurrent exhibitions at Hemphill Fine Arts and Civilian Art Projects. His grandfather has made an appearance in earlier work, as Caldwell appropriated his 1961 Super 8 hunting videos for an installation at his last exhibition at Hemphill in 2007. But you will not find any people depicted in the 38 photographs that make up this current survey. You will encounter seven-foot-tall shotgun shells, enlarged from what Caldwell, 46, has collected while walking his property in St. Mary’s County near the Chesapeake Bay, and following his dogs as they sniff down old game trails. His expansive land has appeared in previous photographs as the staging ground for stark portraits of friends, but the shell prints — called “spent” — are something new and the standout of Caldwell’s current work. In fact, his work on the shells is so extensive that Civilian’s show is dedicated almost exclusively to the series, as a complement to the five monumental prints at the center of the exhibition at Hemphill, which has represented the artist since its opening in 1993. The monoliths each manifest a different history, with their warped surfaces revealing their moment of impact and aggression, when they were used and then discarded. The photographs are painterly with shimmery purples and greens, hot pinks and bright yellows, and warped edges and metallic corrosions, all set on flat white backgrounds. There are no specific narratives attached to these items, as they are remnants of an ongoing fraternal legacy. But Caldwell is reclaiming that history, however vague, as an extension of his own. The shells are only part of what he has found on his routine walks; he has stumbled upon deserted duck blinds and some forgotten flora and fauna, also captured in his photographs. What makes these images so striking, though, is not their subject but Caldwell’s signature treatment of his prints. Mounted on custom-made wooden frames, the photographs are covered with wax and buffed, giving them a luscious surface more typical of painting than photography. At Hemphill, a portrait of milkweed releasing delicate seeds against a black background looks like a 16th-century Dutch still life. A found bird’s wing, perhaps belonging to an oriole in its better days, possesses a jewellike glaze as its bright red feathers are memorialized in fine detail — though at seven feet tall. In reality, the images are far from the traditional guise of painting or photography. To capture these found objects, Caldwell pressed each subject directly to the flat surface of a scanner, covered them with a hood and pushed a button: no camera, no aperture, no vantage point involved. Caldwell’s subject matter, as it turns out, is only the vehicle for his greater dialogue with the history of his medium. He questions what fits into the definition of photography. Does a scanned object count? Must photographers use a camera? Must prints offer a certain truth, in the spirit of a documentary? Caldwell addresses these inquiries in three parts at Hemphill. Although the meat of the exhibition is rooted in the found objects — shotgun shells and wildlife — the surrounding images show Caldwell’s experimentation. At the front of the gallery are prints from the “how to survive your own death” series, built around a mistake. While transferring Super 8 video to digital for an earlier project, he stumbled upon a corrupted file. For Caldwell, the aberration, a collection of colored splotches linked together and oozing like a psychedelic viscous liquid, revealed what his digital prints were made of — unreadable and infinitely complex. He enlarged and enhanced pieces of the mother image to question the place of this digital noise in the grand scheme of photography. At the rear, he exhibits portraits of duck blinds photographed with film using a hand-held camera. Shown in different seasons, the images illustrate these forgotten locations in various stages of decomposition as, once used and cherished, they are now left to decay. Here, he embraces conventional photography. Though an engaging dialogue, these peripheral works fall short — the corrupted images robbed of their elegance by pixilation, the landscapes weighed down by their conservatism — but only in comparison to the heart of the exhibition. Caldwell shines in his romantic treatment of the decaying shotgun shells and found wildlife as he creates a new form of sanctified space, somewhere between traditional and digital.